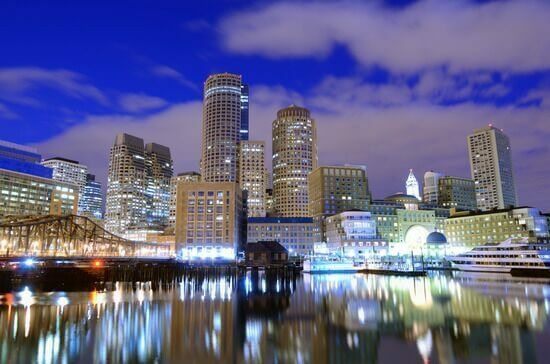 Boston is one of the most exciting cities in the country, no matter what kind of lifestyle you love to lead. Wondering which parts of the city are best to live in? If you’re planning a move to Boston, you’ll want to know where the best neighborhoods are. Keep reading to learn about our favorite areas on the Boston map! We’ve outlined the top neighborhoods in the city. In Beantown, there’s a little something for everyone. Back Bay offers the quintessential Boston experience. When you think of Boston, you might think of the gorgeous waterfront, stately brownstone apartments, and historic churches. The Back Bay neighborhood has all of that and more. These days, rental costs in Back Bay are among the highest on this Boston map, but you get what you pay for. World-class restaurants, towering architecture, and a robust shopping scene ensure that Back Bay will reward you if you can afford it. Famous landmarks and tourist destinations in Back Bay include the John Hancock Tower (the tallest building in New England), Trinity Church, and the Boston Public Library. Nestled in the shadow of Harvard University and Harvard Yard, Harvard Square is a charming, bustling neighborhood filled with college students, young professionals, and people from all walks of life. You don’t have to be a grad student with your nose buried in a book to live here. New bars, cafes, restaurants, and boutiques pop up all the time in Harvard Square, and there’s always something to do if you like to be out and about. But don’t let the “college-town” reputation of Harvard Square scare you away. The university has its fair share of party-goers, but many families live in the neighborhood as well. For a slice of Europe on this side of the Atlantic, look no further on this Boston map than the North End. Believed to be the oldest neighborhood in Boston, the North End has retained much of its old-world charm. Family-owned Italian restaurants are sandwiched between historic landmarks, like the Old North Church and Paul Revere’s House. But like other neighborhoods in Boston, the North End features a good mix of vibrant nightlife and quiet living. The neighborhood is also home to many of the sites on Boston’s famous Freedom Trail, a path that guides tourists through many of the city’s Revolutionary War era landmarks. If you decide to live in the North End and you have friends or family visiting you from out of town, you won’t have to go far to see Boston’s most famed sites. If you crave diversity, Boston’s South End is the neighborhood for you. The South End has served as Boston’s melting pot for centuries, attracting immigrants from all over the world. Today, it is also home to a sizable LGBT community. Owing in part to its diversity, the South End treats its residents to year-round festivals and events, ensuring that there is always something to do in the neighborhood. The South End is one of the best residential neighborhoods in Boston because of the number of parks in the area, so there are plenty of opportunities for recreation. These parks are adjacent some of the most elegant Victorian homes in the country. Looking for a small-town feel in the heart of the big city? Charlestown is the neighborhood for you. Charlestown is the home of many long-time Bostonians; if you want to be entertained by colorful stories of how things used to be, this is the place. It’s believed that many of the people that fled Ireland during the potato famine eventually settled in Charlestown. The area’s sizable Irish population today is indicated by the many Irish drinking establishments around the neighborhood. Charlestown also has great significance in American history. It’s home to Bunker Hill, the site of the Revolutionary War’s first battle. The battle is commemorated by a massive monument that visitors can ascend during daytime hours. The neighborhood is also home to the U.S.S Constitution, a warship that operated during the War of 1812. It has been kept in pristine condition since then, treating visitors to battle reenactments and unique experiences on a daily basis. Besides being famous as the home of a certain bar where everybody knows your name, Beacon Hill is considered today to be one of the most coveted neighborhoods in Boston due to its understated elegance and proximity to local attractions. Boston Common is one of these attractions, boasting the reputation of being the oldest public city park in the country. Another neighborhood popular with college students, Allston/Brighton is a great area for nightlife and affordable housing. It’s a great area for students because of its location, equidistant between Boston University, parts of Harvard University (including their sprawling football stadium), and a few buildings belonging to the Berklee College of Music. The largest neighborhood on this Boston map by a wide margin, Dorchester was actually considered its own city before being annexed in the early 19th century. It is now home to an extremely diverse community and a large percentage of people with higher education degrees. Famous as the home of Fenway Park, one of the holiest sites in baseball, Fenway-Kenmore also features a variety of apartment buildings and small businesses. The neighborhood is very easy to get to with public transportation, although train platforms can get extremely crowded on game days. For those who don’t have a taste for sports, the world-renowned Isabella Stewart Gardner Museum is also located in the neighborhood. It’s one of the best places to see exotic art in the entire world. One of the city’s many hipster enclaves, Jamaica Plain has attracted people from all walks of life for years. The neighborhood remains one of the most unique places to live on this Boston map. The real estate market in the neighborhood is fluctuating constantly. But there is never a bad time to put your roots in Jamaica Plain. Boston has a little something for everyone. You’re guaranteed to have a unique cultural experience regardless of the area. Do any of the neighborhoods on this Boston map pique your interest? Contact us to find the perfect apartment or house for you!